Canadian filmmaker Justin McConnell's latest feature, Lifechanger, is a fascinating and engaging piece of science fiction/horror that succeeds far beyond its limited means in delivering an unusual experience for film fans looking for some brains with their body horror. The story of a being named Drew who believes he can live forever by draining the life from host after host, taking the lifeforce from unwitting victims, is an examination of our most base drive for survival. We begin with Drew having just taken over the body of a young woman, leaving her corporeal self a dried up husk after "he" takes her body, memories, and senses for his own, fending off the eventual rot that sets in when he stays in the same body for too long. In order for Drew to survive, someone else has to die, therein lies the conundrum. Drew is no murderer, he doesn't want to kill; but he has no choice if he's going to stay alive. Lifechanger is tragic, sad and ultimately lonely, ending with a story in hand that cannot be told to anyone else. Going into Lifechanger, I was expecting a gooey sort of body horror film, which - by the way - I would've been completely fine with. I definitely got that, though the gooey bits are fairly limited, but I got so much more. Most films of this type would spend a great deal of energy one what Drew is, what kind of creature he has become and how to defeat it. Lifechanger takes a completely different approach and instead puts the focus on who Drew is and why he feels he must do what he does. It's an interesting reinterpretation of the body swapping/stealing idea that pays off in spades. Lifechanger is easily one of my favorite indie genre films of the year so far, and it's now available on home video with a heaping helping of bonus material that really helps to contextualize what a triumph this project really is. First of all, this review pertains to the Canadian Blu-ray release by Raven Banner. There is a US disc from Uncork'd Entertainment that is identical in terms of content, however, the two versions have different cover art and the Canadian disc is factory pressed, while the US version is MOD (manufactured on demand). 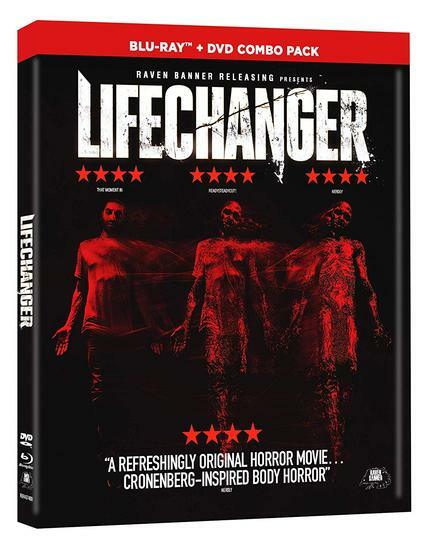 Lifechanger's Blu-ray release should create a template for this kind of hand-made indie horror. I tend not to spend much time on the A/V of these contemporary releases, just because the vast majority of modern films are filmed digitally, so there's no need to talk about "transfers" as there is nothing to transfer from. This is also the case for Lifechanger, it looks and sounds great, and for those with nice home theater setups, you're in for a treat. I particularly enjoyed a few of the little touches in the DTS-HD MA 5.1 surround audio track, nothing that'll test your system, but the immersive quality of the track during key moments was definitely appreciated. Where the disc really stands out is the stellar selection of bonus material, all carefully crafted and collected by McConnell. We get two commentary tracks; a solo track with the director and a second track with McConnell and his most of his main cast. We get plenty of behind-the-scenes production anecdotes, as well as insights into character and technical notes on the film with little overlap between the two tracks. There are also twenty-five minutes of deleted scenes with commentary, trailers, stills, and storyboards, and a BD-ROM version of the original score by McConnell's frequent collaborator Sean Motley. However, the real gem of the disc is the behind the scenes doc. Change and Adapt: The Making of Lifechanger is a 104-minute (20 minutes longer than the actual film) making-of documentary that tracks Lifechanger from McConnell's point of view over the course of about four years. We follow McConnell from the very early concept phases, thanks to comprehensive self-recorded video diaries, all the way through to the film's release in theaters and on VOD. It is fascinating to watch the film move from early script phases through the challenges of finding funding/losing funding, looking for grants and government assistance, securing financing and moving into pre-production and actual production, post-production, festival screenings, marketing, commercial release, and beyond. The whole journey is here, and for every moment of triumph, there's an accompanying moment of disappointment and even occasional failure, but through it all, McConnell persists. It's actually quite inspirational, not only for those who might be interested in getting into the business, but anyone in any artistic field. The road to a successful ending isn't paved in gold, it's built with blood, sweat, and tears; making the fact that this project is so successful on its own terms all the more triumphant. McConnell's doc is full of insight into not only the actual production of the film, but also into the challenges of overcoming the kind of disappointment that comes with any film production and hopefully coming out on top. Lifechanger is a great film that succeeds far beyond its means, and this disc is exactly the kind of monument it deserves. An excellent A/V presentation of the film bolstered by a comprehensive look at what it takes to make something this special happen. Highly recommended.